Du kan välja upp till totalt 4 resenärer. Resa i stil med luftkonditionerade Silver Spirit Rolls Royce som du tar i Margaret Rivers vingårdar, bryggerier och landskap. Dina helgedagsturneringar besöker fem vingårdar, två bryggerier och inkluderar lunch och provningar av lokalt producerad choklad, ost eller olivolja. Fortsätt i en lugn takt med tiden för att njuta av varje stopp, med inblick i kommentarerna från guiden och kallt flaskvatten i bilen. 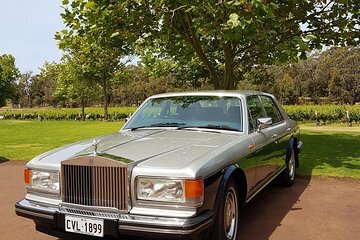 We booked this Margaret River tour for my mother's birthday and without a doubt we had a wonderful time with Bill and the beautiful Rolls Royce! Bill picked us up promptly at the agreed time and from then on took care of every single detail until the end of the day when we were finally ready to return to our accommodation there's only so much wine, beer, chocolate, olive oil and chutney one can taste in a day!. The car itself is in mint condition and was extremely comfortable for 4 people. Bill had arranged an action packed schedule 5x wineries, lunch in a brewery, a scenic photo stop, an organic foods store and another brewery to finish the day, however the best part was that when we inevitably got off schedule due to particularly liking the wines at certain vineyards, rather than try to hurry us along Bill just shuffled the itinerary around without us having to worry about a thing! The wineries we visited were a good mix of big, small, specialist in terms of grape variety or process and wide ranging and the included lunch was very tasty NB: we found the food everywhere in Margaret River to be quite good. The tour is of course customisable prior to the actual day of the tour! but we were happy to just see a variety of wineries as planned by Bill. I would highly recommend this tour for any special occasion or even just if you have 2-4 people as I note that other 'guided private tours' for 2-4 people in a plain-old air-conditioned van are roughly similar in price!